A little while ago I hung this shelf in our kitchen for glass and small jars, pitchers. I debated about having anything at all above the sink and for over a year I left it blank-except for Annalenna's rail which has relocated to the bedroom since. After much nail biting and shelf searching I tried this simple floating shelf my husband and I made. After all the work of making it and hanging it I instantly hated it but I did like having glasses and coffee cups out in the open so I opted for this simple curved shelf from Ikea. Vipp also makes one similar but I liked how this one had no black rubber lining (vs the Vipp shelf) and it was less of an investment in case I hated it as much as the black one. This weekend we are going to tile the backsplash in the kitchen and I'm thinking of going up this wall as well, rather than stopping level with the bottom of the upper cabinets. Still unsure though, time will tell. The past several months I have been extremely indecisive and unable to choose, which is driving me nuts and I'm ready ti just dive into a project and get it done already. 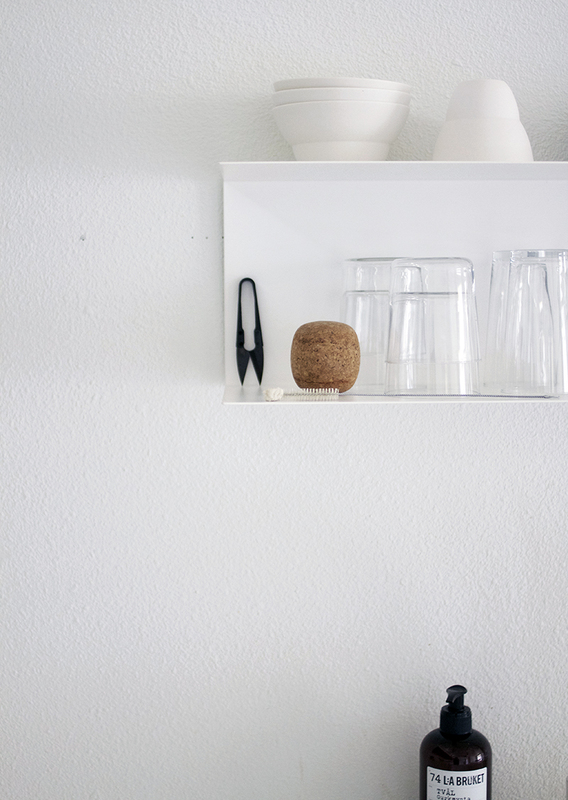 A few items on my shelf are these Vipp bowls and cups, Muuto cork lid for the glass carafe (currently being used as a vase) and Muuto pitcher, Ferm Living brass measuring cup, Menu phold container, La Bruket hand soap and a vase to hold my dish brushes from House Doctor. 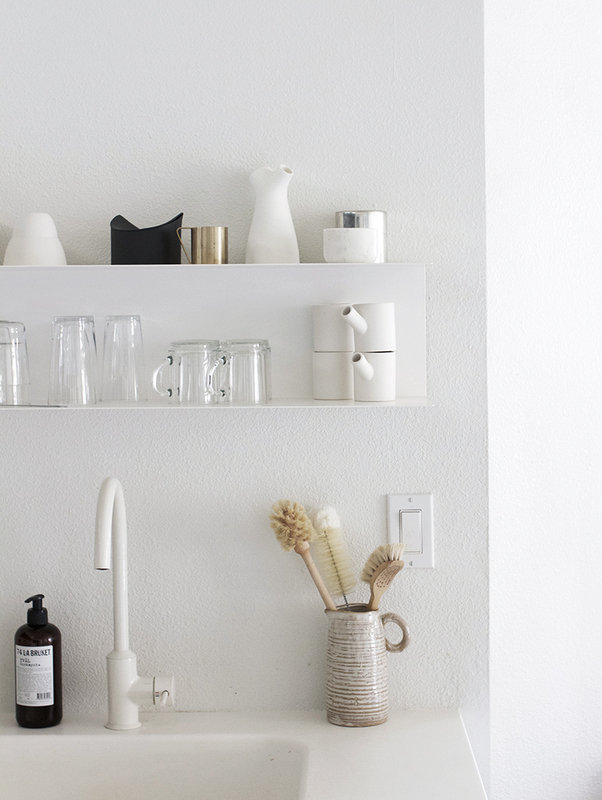 I like the appearance of the floating shelf and how you only have white, glass, little black and brass there also but personally I like everything closed away in my cabinets and nothing but he coffee maker and cooking essentials like olive oil, salt, pepper and garlic on the table.